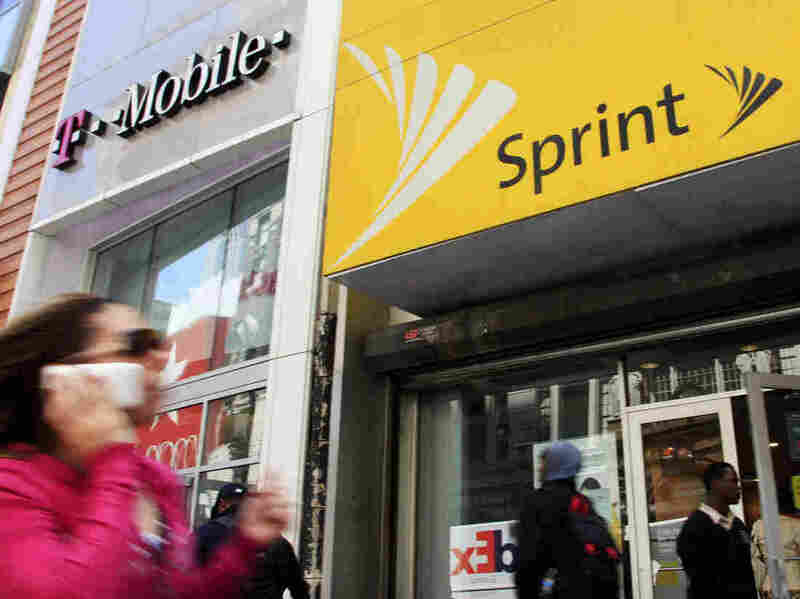 Potential T-Mobile And Sprint Merger Falls Apart : The Two-Way The third- and fourth-largest U.S. wireless carriers had been in talks for a long time but announced Saturday that they could not agree on mutually beneficial terms. Had T-Mobile and Sprint completed a merger, Reuters says the new company would have claimed more than 130 million subscribers. "The prospect of combining with Sprint has been compelling for a variety of reasons," said T-Mobile President and CEO John Legere in a statement. But, he continued, "we have been clear all along that a deal with anyone will have to result in superior long-term value for T-Mobile's shareholders compared to our outstanding stand-alone performance and track record." T-Mobile has seen growth in customer numbers in recent years, which many view as a reward for pioneering more customer-friendly options such as dropping two-year contracts, The Associated Press reports. Although it has cut its costs, Sprint is saddled with considerable debt and has endured numerous annual losses. Sprint President and CEO Marcelo Claure said: "While we couldn't reach an agreement to combine our companies, we certainly recognize the benefits of scale through a potential combination. However, we have agreed that it is best to move forward on our own." Rumors surrounding the merger reached a fever pitch in October, when many speculated an agreement was near. But earlier this week, reports had begun to surface that talks were deteriorating. Both carriers are still substantially smaller than the Top 2 in the industry, Verizon and AT&T. Had T-Mobile and Sprint completed a merger, Reuters says the new company would have claimed more than 130 million subscribers. Previous attempts have been made to court T-Mobile, but they appear to have run into trouble with federal overseers. In 2014, Sprint came close to buying the company but was reportedly scared off by the threat of regulatory action. AT&T had flirted with the idea of purchasing T-Mobile in 2011 but backed off after both the Justice Department and the Federal Communications Commission expressed their displeasure with the potential deal.